I'm currently building another set of shops for Esme and everything has come together except the ugly modular stairs. Is there anyway to prevent solid modular game stairs from sending an ugly block right down to the ground floor? Upstairs is a cinema using stage with 2 small set of steps up and down. The only thing I can think of is download matching open Euro stairs and use them upstairs on the stage. Would that prevent them going down to the ground? I would rather have the staircase the same all the way up and prefer the solid sides, but short and open is better than 2 of those things. This is what I was thinking of downloading http://modthesims.info/d/307970 Would those work? For my museum - I used stage and stairs - but there was no stair block underneath it. What that looks like is that your stairs from the stage, don't actually recognise the floor. That they're seeing the ground floor as the floor that they're actually based on. When you say two small sets of stairs, do you mean that there are two modular stairs put to be one stair, or two modular stairs in two different places? The only game stairs that recognize the upper floor as the floor, are the modern open ones or the glass ones. The black metal also go all the way down but as long black skinny poles. The Euro stair is in two places, once at the entrance to the cinema, where the curtain is top right. The second is the one shown there from the upper seats down to the lower seats. I tried removing and replacing with the same effect. Trouble is the whole thing is already built including other shops on either side of the cinema. I see what you mean... I used the modern stairs in mine. I also notice that you can only see the stairs looking from top to bottom - when on the bottom floor the block disappears. Do you want me to have a look at the difference with the stairs and see if it's a variable - and if so - I'll make you a custom one to fix it. It's just the Euro one, right? I've seen the other solid modular game stairs do it before too. 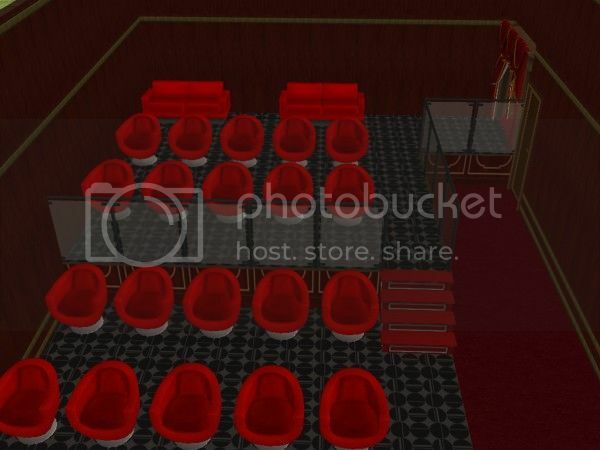 It's in the small mayors house I uploaded where I put kids beds up on a stage. I wasn't real happy with it there either, but it wasn't so obvious due to the different design. 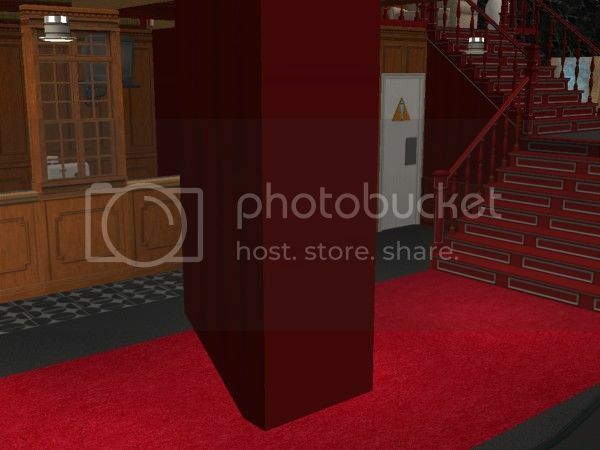 If you go up a level you can see the block from the top of the stairwell looking down to the foyer and if you are up stairs and lower the camera down and also a little from outside when I put all the walls up. This building just uses the red Euro stair, and I'll build you whatever you want if you can fix it! Coolness. I'll see what I can do. OK - it looks like a combination of OBJf and BHAV change. I have no idea whether that can be made into a fix for all stairs - Kiri is not a modder. Interesting... that made it unplace-able. OK - It looks like you should go with tbudgett's stairs. You'll need to add the stair script using scriptorium and it is open underneath, but it doesn't go down to the bottom - not even a column. So that will work for you. In the meantime - I might have to get help with people who actually understand bhav's about what's going on with the original stairs. Thanks for looking Keri. Unplaceable hmm. They did something different making the modern and glass to all the others. The difference between the stairs is the mesh. Most mod stairs have the big mesh going to the floor, which is why creators have made open underneath stairs. Changing bhav's isn't going to remove the mesh part. Thanks for the explanation HL, but ugh why couldn't they have made it stop at the floor above? I didn't quite understand what that was all about. Is there somewhere that I can read up about modular stairs? I don't expect ever to be a modder - but I do like to understand how the different pieces fit together.